No self-respecting organic cheese board should be without this award-winning Golden Cenarth cheese. It’s semi-soft, with an irresistibly smooth, creamy texture. Washing in cider gives the cheese its soft amber rind and distinctive nutty note. Heavenly with crackers and a good glass of red wine, or baked until gooey and golden with crusty bread for dipping. 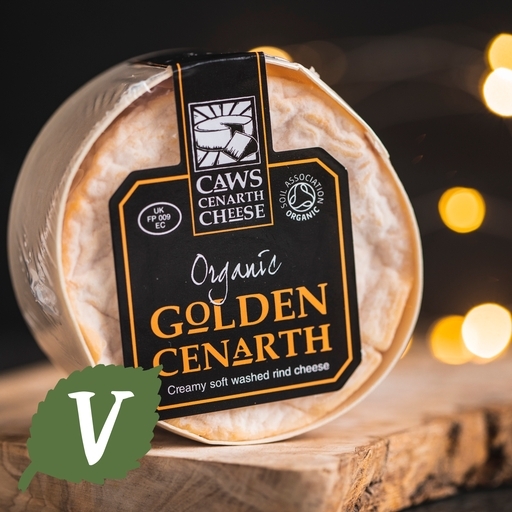 Caws Cenarth is a family business started in 1987 by Gwynfor and Thelma Adams, drawing on a six generation tradition of cheesemaking. These days Gwynfor and Thelma take a back seat, allowing Carwyn to run the business and indulge his obsession for creating new cheeses. Pasteurised cows milk, sea salt*, vegetarian rennet, cultures*.